Born and raised in Lafayette, LA, Sarah grew up with a zest for life in the heart of Cajun Country. She was known to say yes to every new adventure, try all activities at least once and have little use for idle time. She had a dream year with over 20 victories, a national indoor victory, selected as a national top 40 up and comer, and an induction into the hyper elite, eight person, “Women of the Winners Circle” national organization formed by Indy Car Driver Lyn St. James. The amount of effort she and her dad put building those used race karts into winners, the long nights slaving over tire prepping for a big weekend, coupled with the immense hours Sarah spent working at school was a testament to the sacrifice to fulfill her dreams. As with all of her other ventures, Sarah started winning and succeeding in all aspects of her life. Recent Graduate of the University of Louisiana with a Marketing degree and a member of their top tier Wind Ensemble Stage Band, she amassed more honors in both school and on the track. It’s another list, but it’s worth reading: Cover Girl for three separate magazines, Scholarship awarded by the School Professors for most outstanding University of Louisiana sophomore, First female in history to win GCRS Road Racing Series Championship, One of the youngest to be asked as a member of The City of Lafayette Wind Ensemble Stage Orchestra, one of the only females in the country to win a NASA Series Road Racing Championship, Awarded Sponsorship by The City Of Lafayette Tourism Commission, the only racer in the country partly sponsored by a municipality, became the first and only Professional Sports car Racer in Louisiana, Youngest female in the country to receive a High Performance Instructors Badge from Porsche Club of America and the list continues on and on. 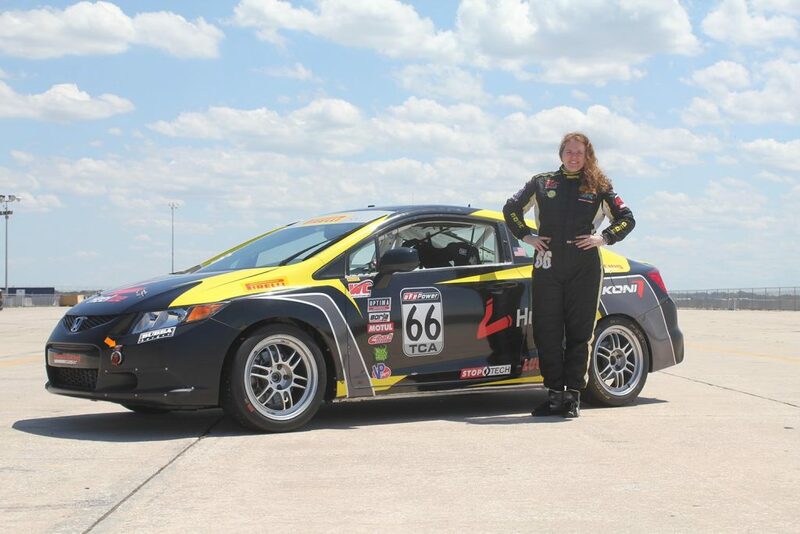 In an effort to summarize and be as brief as possible when it comes to Sarah, in 2015 and 2016, she has been racing professionally all over North America in the Travel Lafayette, Lemons of Love bright yellow MX-5 Cup Race Car in the series called Battery Tender Pro MX-5 Cup presented by BF Goodrich Tires. Being the only full-time female in a male dominated sport, thousands visit her website, Facebook and Twitter accounts to keep up with her. It’s also been great for her in the media, with radio, magazines and TV stations doing regular stories on the red haired Ragin’ Cajun tearing up racetracks all over America. Realizing that only because of the help of others has made the pursuit of her dreams possible, she has donated time, money and effort into many charities, including her most important, the Lemons of Love Chemotherapy Support Organization out of Chicago. Sarah’s plans are to continue her phenomenal rise in the Sports Car Racing arena, gather more media attention and sponsors so more help can be brought to the charities she supports. And if the past has any bearing on the future, one shouldn’t bet against her.